There are plenty of Little Free Libraries in our neighborhood. This one began life as a miniature replica of the house behind it, but was poorly waterproofed and was soon holding a shelf of very soggy books. 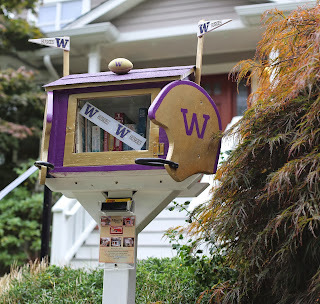 This replacement has a University of Washington Huskies Football theme, and was cozy and dry when last inspected.